Vi ricordate keepvid, il sito che avevo citato in un altro post? Oltre a ciò ha una maggiore compatibilità con i siti di video. 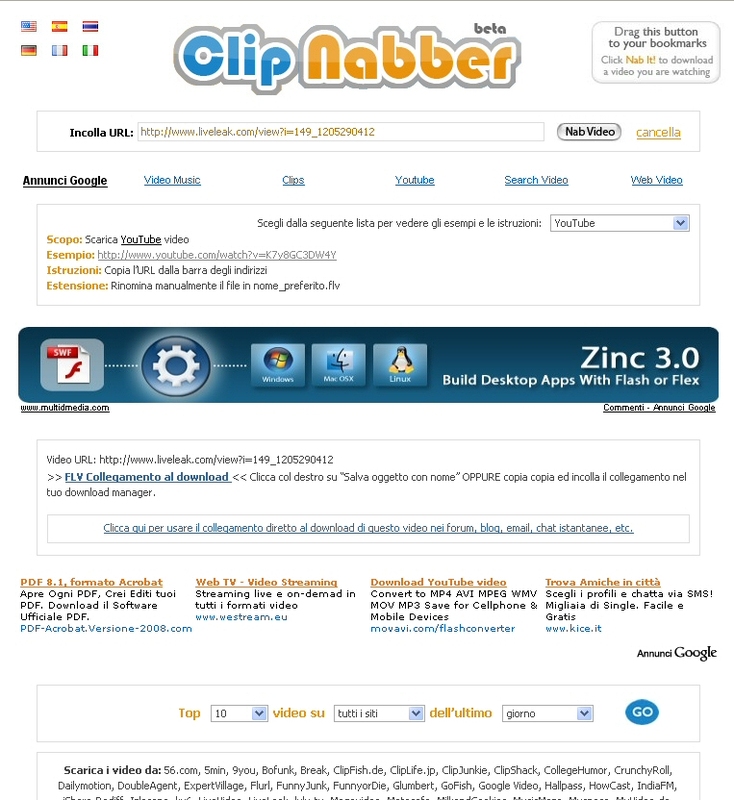 Quelli compatibili sono:YouTube, MegaVideo, Dailymotion, Veoh, Metacafe, 56.com, Myspace, Break, Google Video, 5min, 9you, Bofunk, ClipFish.de, ClipLife.jp, ClipJunkie, ClipShack, CollegeHumor, CrunchyRoll, DoubleAgent, ExpertVillage, Flurl, FunnyJunk, FunnyorDie, Glumbert, GoFish, Hallpass, HowCast, IndiaFM, iShare.Rediff, ku6, Izlesene, LiveVideo, LiveLeak, lulu.tv, MilkandCookies, MusicMaza, MyVideo.de, PokerTube, Putfile, SantaBanta, Sharkle, Shoutfile, Spike, Stage6, StupidVideos, SuperNovaTube, TeacherTube, Tudou, Twango, Videa.hu, Vidiac, Vidivodo, Vimeo, WeWin, Yahoo Videos, Yikers, Youku, ZippyVideos. Tags: 2008, 56.com, 5min, 9you, ALT, Altervista, Blog, Bofunk, Break, Carlo, ClipFish.de, ClipJunkie, ClipLife.jp, ClipNabber, ClipShack, CollegeHumor, Content, CrunchyRoll, Dailymotion, DoubleAgent, ExpertVillage, File, Flurl, Formato, Forum, FunnyJunk, FunnyorDie, Glumbert, GoFish, Google, Google Video, Hallpass, HowCast, ID, IndiaFM, Indirizzo, Iran, iShare.Rediff, Izlesene, Keepvid, ku6, LiveLeak, LiveVideo, lulu.tv, MegaVideo, Metacafe, MilkandCookies, MusicMaza, Myspace, MyVideo.de, PG, Po, PokerTube, Post, Putfile, San, SantaBanta, Scaricare, Senza categoria, Sharkle, Shoutfile, Sito, Spike, Sport, Stage6, StupidVideos, SuperNovaTube, TeacherTube, Tudou, TV, Twango, Veoh, Videa.hu, Video, Vidiac, Vidivodo, Vimeo, WeWin, Yahoo Videos, Yikers, Youku, YouTube, ZippyVideos. « Aiuto, ho un ufo sull’ala!